I call this drill “Don’t Lose”. The boys love playing Knockout,one of the more popular [tag]basketball rebounding drills[/tag], but I noticed that if the rebound went long and they knew the guy following them was going to make his shot that they would quit. So I tried to add more competition to the game. From an angle that using the glass would be the best shot, I have the boys line up. The first player shoots the [tag]basketball[/tag] off the glass and attempts to make it. If he makes his shot he goes to the back of the line. If he misses and the player following him makes his shot before he can make the follow then he is out. If the first player misses he is allowed to defend the next shooter, take his ball on the rebound anything goes except fouling. If the first two shooters have both missed thier shots I will throw another ball to the waiting shooter and give him a chance to knock both players out. Purpose: I think it adds a level of competition and a never say die attitude. Also since the boys didn’t like using the backboard it was a way to teach them to use the glass. Would you like to contribute coaching tip of your own and share it with our community? Leave a comment in the box below now! 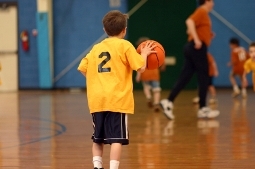 And for more practice suggestions, check out this youth basketball drills article I just completed.